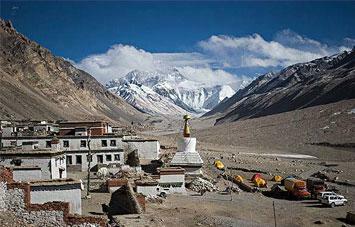 Adventure Pilgrims Trekking Offers Magic of Tibet includes two country border crossing is friendship bridge. The Tibet Overland Tour is 8 days adventure tour in Tibet with one way Trans Himalayan breathtaking flight. Drive from Kathmandu to Lhasa and fly back to Kathmandu from Lhasa city or vice versa is possible in this trip. 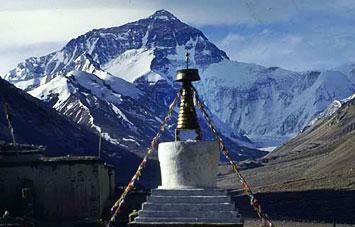 Overland tours to Tibet are for those who love to Himalayas and high altitude lands. Our overland Lhasa city tour offers the great opportunity to feel the driving experience in high altitude and this tour can really answer the curious questions about the Tibet and its high Plateaus. The first day of this tour begins with a 123 Km of drive from Kathmandu to Zhangmu or a 156 Km drive from Kathmandu to Nyalam through stunningly beautiful country sides of Nepal in to the China through the Friendship Bridge. Second day passes with excitement as you will drive uphill to the high Tibetan plateaus to Xegar where you will get to see the true Tibetan landscape. From the high plateaus you can observe and photograph high mountains like Mt. Cho Oyu and Mt. Shishapangma. Day three of the tour from Xegar to Xigatse passes in a scenic drive crossing over Gyatchu La Mountain. On this road you will find a route to the Mt. Kaikash. You will have to wait for the morning sightseeing and Panchen Lama’s Tashilhumpu monastery visit after which you will drive to the Panchen Lama’s Tashilhumpu monastery and come back to your hotel to stay overnight. On the fifth day you will drive full day crossing over Karola, Kambala, and colorful Yamdrok Lake and the Tibetan lifeline river Bramha Putra to the holy city of Lhasa. Lhasa deserves two full days of your attention and visit. Here you will visit Jokhang Temple, Barkhor Street, Potala Palace, Drepung and Sera Monasteries. Don’t forget to buy something for your people back home in the Lhasa streets. 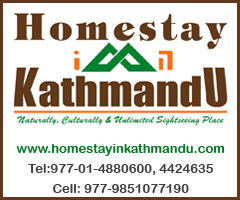 The 8th and the final day of your tour take you to the airport for your departure flight back to Kathmandu or other destination as you have planned. You will enjoy your Tibet tour by traveling overland from Kathmandu to Lhasa and scenic mountain flight over the Himalayas. Early morning scenic drive to KODARI ( Nepal - Tibet border)through the beautiful Nepalese country side and after necessary border formalities both at Nepalese and Chinese immigration, check in to hotel. Overnight at Guest House. Day drive uphill to the highest plateau of the Workd with the typical view of Tibetan landscape offering sheering sheer feeling of standing on the roof of the world crossing over LALUNG LA (5,050M) weather permitting with breath taking panorama of beautiful Himalayan ranges including Mt. CHO OYU (8,201m) and Mt. Xishapagma (8,012m) but dwarfed by the vastness of the Tibetan plateau. Overnight at Guest house/Hotel. Continue scenic drive crossing over Gyatchu La (5,220m), the highest pass en route to Lhasa via Lhatse from where a read to Mt. 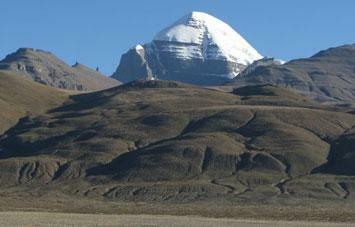 Kailash Bifurcates to the west. Overnight at hotel. Morning sight seeing to the Panchen Lama’s Tashilhumpu monastery. Drive to Gyantse and visit to the Kumbum Stupa and Pholkor Monastery Overnight at hotel. Full day picturesque drive crossing over Karola (5,010m), Kambala (4,794m), and colourful Yamdrok Lake and the Tibetan lifeline river Bramha Putra (Yarlung Tsangpo). Overnight at hotel. Two full day sight-seeing tour to Lhasa including Jokhang Temple, Barkhor Bazzar, Potala Palace, Drepung and Sera Monasteries. Overnight at hotel. Accommodation on twin sharing room basis. Except at guest house.